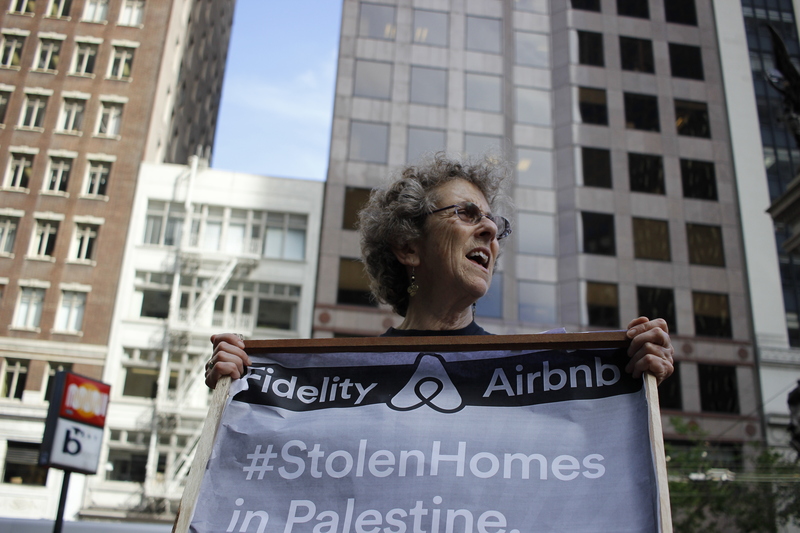 Demonstrators lined up outside one of Airbnb’s biggest financial backers in downtown San Francisco recently to denounce the rental company’s listing of homes in occupied Palestinian territory. For the demonstrators, the issue was political. For Noura Nimer, the protest was also personal. Because she is cutoff from her family, the issue really hits home, she said. Nimer marched with protesters from Jewish Voice for Peace, or JVP, an advocacy group opposed to the Israeli occupation. JVP organized the demonstration as part of its campaign to pressure Airbnb to change its business practices in Palestine. The June 3 demonstration, which attracted about two dozen people, was reminiscent of protests decades ago demanding that universities and financial institutions stop doing business with South Africa, which was then ruled by an apartheid government. More recently, groups sympathetic to the Palestinian cause have waged a similar campaign against Israel. Fidelity, the protesters believe, may have the muscle to convince Airbnb to change its policies now that the home-sharing company is reportedly considering a public offering. Airbnb allows its users to rent properties located on illegal settlements and takes up to 15 percent of the revenue. Organizations including JVP maintain the company’s policy increases property values and displaces working-class residents in Palestine. Airbnb did not respond to multiple requests for comment and has made few, if any, public statements concerning the issue. With signs held high and chants barely breaking through the cacophony of a bustling downtown San Francisco afternoon, the protesters demanded that Fidelity Investments, one of Airbnb’s primary investors, stop investing in a company that rents homes on occupied land. Airbnb was the original target of JVP’s protests, but after the company brushed aside the criticism, the group decided to focus on its investors. “We are calling on Fidelity to exercise its influence with Airbnb to get them to cease profiting from illegal settlement activity,” said Alexei Folger, a volunteer organizer with the protest group. Though Airbnb is privately held, there has been speculation that it is planning an initial public offering in the near future with Fidelity as a key backer. If that’s the case, Fidelity may have the power to convince Airbnb to change its policy, said Folger. No one inside the Fidelity building would comment during the rally. Later, a spokesman issued a response by email. “Our funds invest in thousands of companies around the world and it’s our longstanding practice not to discuss specific fund investments or investment decisions,” Banker added. Folger said the coalition held a rally at Airbnb’s headquarters in March where participants collected 150,000 signatures on a petition against the company’s actions. But Airbnb declined to accept the petition. “We’re doing this today so we’ll see what, if anything, Fidelity has to say,” she said. The thought of foreigners enjoying vacations in occupied land galls Nimer. “If I, as a Palestinian, wanted to rent one of those homes in an illegal settlement I would not be allowed,” she said. I remember the protests at UC Berkeley in the 1908s. They had an impact! This entry was posted on June 16, 2016 by Bay News Rising and tagged airbnb, banking, Fidelity, finance, Gaza, Israel, Jewish Voice for Peace, JVP, Palestine, protest, Rally, West Bank.